“Name Australia’s first published novelist” is, I think, a question that would trick most Australians at a trivia night. Rod Howard, who wrote the biography, A forger’s tale, about this writer would agree, as would the writer in the West Australian in 1950 to whom I referred a couple of months ago. Henry Savery, in other words, is not a household name in Australia though, as Howard says in his Author’s Note, there are a couple of minor streets and a biennial short story competition named for him which prevent his complete slide into obscurity. Why is this? Besides describing Savery as “a son of fortune undone by folly and fate”, Howard argues that the book, Quintus Servinton, received little attention during or in the years after his lifetime, partly because “it had neither the ghoulish titillation of a Newgate novel nor the fashionable allure of a society saga”. Moreover, its publication year, 1830, was a time he says “when public debate was dominated by Arthur’s Black Line* – a brutal but farcical attempt to corral the island’s remaining native inhabitants into the island’s southwestern corner”. Howard concludes, in the Author’s Note, that “once you have become obscure it can be terribly difficult to enter the limelight”. And so, as was also characteristic of the author’s life, the book’s poor “fate” was the result of a combination of factors – Henry’s own history (about which I’ll talk more next), the work itself, and external issues like the political and social situation of the day. Who, then, was Henry Savery and how did he come to write the first “Australian-made novel”? He was born in England in 1791, the son of a generally respected country squire and magistrate. His father, Henry claimed, believed his son’s future had been foretold by a gypsy. Unfortunately, much of what the gypsy foretold did eventuate. Henry was three times “in danger of sudden or violent death”, by his own hand it must be said, and he did, at least three times, “undergo great reverses of fortune”, as much by his own poor decisionmaking, particularly regarding money, as by bad luck or the actions of others. It’s a rather tortuous story characterised by politics, naiveté, poor decisionmaking, loyalty and betrayal. Howard manages to keep the narrative clear, though you do have to concentrate to keep all the characters straight. The Savery Howard presents is intelligent, hardworking, often foolish or imprudent rather than dishonest (though dishonest he was), and sometimes just plain unlucky. Right until near the end, he had influential friends who somehow managed to soften the legal impact again and again of his failures and misdemeanours. Howard’s book, in fact, provides an interesting and useful insight into the often grubby workings of 1820s-1840s colonial Tasmania, albeit through the specific lens of Henry’s life. Fortunately (for us anyhow), Henry’s life was a colourful one. When young, he apprenticed himself as a gardener, but he was also interested in literature and demonstrated a capacity for business. However, it was the failure of an early business venture and a conviction for forgery that resulted in his being transported to Van Dieman’s Land in 1825 where his career, as it had been in England, continued its eclectic path and encompassed, among other things, various business enterprises alongside newspaper writing and editing. Henry was, apparently, a good satirist. The columns he wrote anonymously for The Colonial Times while he was in prison in the late 1820s, and which were later published as The Hermit in Van Dieman’s Land, resulted in his employer being tried and imprisoned for libel. Although protected to the end by his employer, Henry of course lost the job. He couldn’t, it seems, take a trick. As soon as he got himself up, something would bring him down. Nonetheless, there were successes, one being that he established the colony’s first vegetable market. That gardening apprenticeship clearly came in handy. Howard writes at one point that “more lyrebird than magpie his situation provided ample scope for reinvention”. How, one wonders, could such a creative, hard-working man come to the ignominious end that he did? I suggest you read the book to find out more! Henry had taken the Hermit’s merciless gun, and turned it, with deadeye aim, upon himself. Although it appears under this shape,—or, as some may perhaps call it, novel,—it is no fiction, or the work of imagination, either in its characters or incidents. Not by this, however, is it pretended to be said that all the occurrences it details, happened precisely in their order of narration, nor that it is the mere recital of the events of a man’s life—but it is a biography, true in its general features, and in its portraiture of individuals; and all the documents, letters and other papers contained in its pages are transcripts, or nearly so, of originals, copied from the manuscript, which came into the author’s hands …. In his Author’s Note, Howard writes of the challenges he faced in researching the book due to the paucity of primary source material. He recognises the dangers in mining fiction for fact but he discovered that “many important aspects of Quintus Servinton (subtitled A tale founded upon incidents of real occurrence) could actually be verified as fact”. Fact in fiction, fiction in fact. It was ever thus, eh? I would love to report that after writing this – our first – novel, Henry went on to have the happy, successful life that he envisaged for himself in his book and as had in fact been foretold by the gypsy, but that’s not quite how it turned out. Henry, described as “a man of talent” by the last judge to try him, ended his days in the notorious Port Arthur gaol. 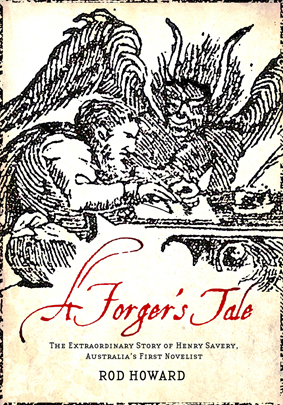 Despite being published in an unusual, diminutive format, A forger’s tale is a traditional biography. I appreciated the Author’s Note and list of sources at the end, but would have liked an index. This though is a minor quibble. Howard has an engaging style making the book an enjoyable read for anyone interested in Australian literature, colonial Australia, convict stories or Tasmanian history. Thanks Brother Gums for a great Christmas gift! * The Black Line has been the subject of some recent Tasmanian fiction, including Richard Flanagan’s Wanting and Rohan Wilson’s The roving party. Fascinating. Do you remember that scene in Educating Rita when the character played by Michael Caine says “Australia’s a paradise for blokes like me.” Always interesting to read the story of someone chalked up as hopeless making good in a different, less restrictive society. Thanks Guy … Remember the film but have forgotten the line … How could I have forgotten it? Poor Henry made good a few times but kept doing himself in … Mostly by his own decisions but often not helped by the malicious actions of others. It’s an interesting story. PS my Benatar humbook arrived yesterday … Might be a little while till I get to it though. I hope you enjoy it as much as I did. There’s a touch of Blanche Dubois there. I’m really looking forward to it … my fingers are itching to pick it up but I must be patient. I have Stu’s (first) Humbook on the go at present and a hefty reading group book to read for next week. I can recommend ‘The Roving Party’ if you’ve not already read it. I will now need to find ‘A Forger’s Tale’. Thanks Jennifer … I have read Wanting but not The roving party. I’d love to read it though …. so it’s in my virtual tbr! Glad to see my Christmas present was appreciated! Remember that the printing press that printed Quintas Servinton and The Hermit … will soon go on display at the Tasmanian Museum and Art Gallery (albeit in a different context). I’m not sure that poor old Henry could ever be said to have made good in the colonies – I think his life really just continued to spiral out of control, sometimes due to his own activities and at others from those of other people. Just a comment too on The Roving Party. This novel is not about the Black Line, although the experiences described in it are certainly similar to those that Black Line participants would have encountered. Rohan Wilson’s novel is based on an earlier period in which (roving) parties were sent out in pursuit of Aborigines. The story is closely based on an incident in party led by Melbourne founder John Batman. Thanks Ian … no, I think you’re right. It’s more like he “nearly” made good isn’t it. Thanks re The roving party. Though it’s set later I seem to recollect references to it. Perhaps I should remove my asterisked comment and leave the matter alone. Something I read suggested a closer link to the Black Line in the book than there apparently is. I think there are a few novels which touch on the subject, while not being quite about it, aren’t there? The English passengers too – at least in my vague memory? Thank you for your interesting post. I’ve placed both Quintus Servinton and A Forgers Tale on my “to-be-read” list. Oh thanks Diane … I’m glad to add to your reading list! Thanks for bringing this author and fascinating story to my attention.By the way, I loved ‘Educating Rita’, and by the way as well, you might recall the suggestion that I write a blog post about 7 Writers. Well, my new website is finally up, and that’s exactly what I’ve done! Thanks Dorothy. So much of our literary history still to explore, eh? And that’s great re the 7 Writers. I shall go check out your post. Thanks so much for your comment on my new blog, and for adding me to your blog roll. It’s fun, this blogging business, eh? A pleasure Dorothy. Yes it is – though you do have to learn to manage it, in all sorts of ways. But so worth it, and a great way to stay connected as we get older. Thanks Tom … yes, I think it’s very worthwhile. Our history is so short, comparatively, that we surely have the opportunity to capture the majority of it. And it’s important that we do. What a character Savery sounds! And Howard’s book seems well done especially since primary sources were few. an interesting piece of Australian literary history! Thanks Stefanie … I think so too .. The only trouble about the illustrations is some are hard to reAd given the small format … But I guess they add authority.